I was a little skeptical about this show going through the first season. I love H. Jon Benjamin as a comedian from his voice work in Adult Swim’s Home Movies and that is what brought me to try this new show on FX. I made it through the short season 1 still willing to continue. I laughed probably 4-5 times per episode, sometimes the episodes got a little repetitive and the jokes became recycled. Season 2 hooked and reeled me in though. I realized from the beginning that this was going to be a show where you had to understand the character mannerisms in order to get the presented humor. Soon the show became moderately funny to hilariously witty and sarcastic. With the downfall of Family Guy and South Park we have been waiting for a funny, raunchy adult cartoon. 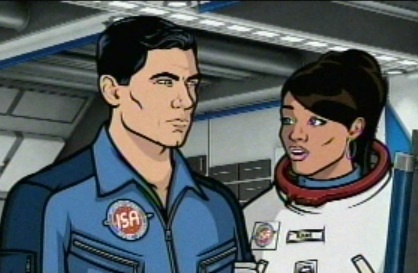 Archer may not exceed the level of classic that those shows did, but it is still insanely funny. It doesn’t seem to be as popular as it should be either. But since when was an original show on FX popular? The voice work in Archer is incredible, also the consistently witty writing and funny impromptu from the very gifted cast. Toward the end of Season 3 the show was beginning to feel a bit repetitive again, but even when I wasn’t laughing I was enjoying the show. It is visually comfortable and overall simply entertaining comedy. I would highly suggest Archer to any fans of the Adult Swim line up. If it was on CN it would be much more popular, it seems like the hipster version of an adult cartoon.